MagicBox launches iPod dock with clock radio for £30 | What Hi-Fi? 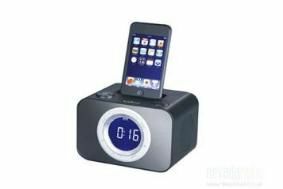 Weighing in at just £30, you'll find a programmable alarm clock, large backlit display, FM radio, sleep/snooze modes and an iPod dock. That dock will charge and play your iPod but there's no mention of iPhone-compatibility, which with a price tag this tiddly may come as no surprise. Available from the Nevada Radio website, the Magicbox Mi19 is on sale now.